Another feature on Facebook has landed, as you can now post on news feed on Facebook, without the post showing on your timeline. Just few weeks ago Facebook introduced how to skip to exciting part of live videos online. Now, here they come with another awsome feature for you and I to have test on. Facebook has been doing its best in coming up with useful and interesting features for all users on its platform. 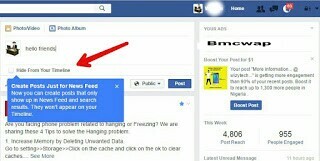 This newly introduced feature is indeed cool for use especially, for those who has a Facebook page. The feature enables you to post on your page, without the thing being posted on your page, showing on your own wall, but can only be seen outside as Facebook feed. For now, the "News Feed - only posting feature' works on Facebook web and not yet available for the Mobile app. It May soon be available for Facebook mobile app. We are just hoping so. Goto www.Facebook.com using your browser and login with your account. Don't use Facebook app to login because, the feature is not yet available on the app, but on web. After login, start to write a status update, do that in the box at the very top of the News feed. Now, you will get to see a new check box which is labeled, Hide from your timeline. Just Tick on that box and that your status update will be posted on News feed without it showing on your Timeline. See the screenshot of that above. You may not see a box or bobble message to tick on, when updating your status, but there you will still see an option where you can choose this very feature for new news feed. Even if you didn't see the bobble message or box to tick, while posting the stuff, you will still see the option to use the new news feed feature.